Technology advances at the same rate our children grow up, with incredible new gadgets and trends appearing every time you blink. For parents the wealth of new technology in our kids’ lives can be daunting. This briefly covers some of the most common ways kids’ use technology to communicate, make friends, share information and have fun. The new generation of mobile phones are much more than just portable telephones. With enough memory to store and play music, access to the internet, a camera, text and games the phone itself hardly gets used. From a parent’s point of view the key things to be aware of with mobile phones is how the usage is billed and what your child is using the phone for. If they do have a fully multi media phone it’s not as simple as texts and talk time. Internet time can add up and some companies, once you’ve registered keep sending messages which the user is charged for at a premium rate. 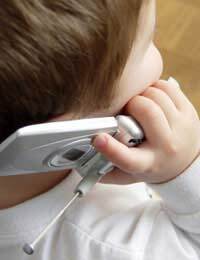 Many mobile phone networks offer the option to cap spending so that your child doesn’t go over a set limit each month. Others have multimedia tariffs so the user has a set amount of texts, internet minutes and picture messages (as well as talk time) for a fixed fee each month. Pay as you go options take away the risk but generally don’t offer such good rates and the phones are more expensive. Instant Messenger is the point where email meets a phone conversation, once registered you can ‘chat’ to friends in real time. Instant Messenger applications are free and do offer an easy way for kids to keep in touch with friends. The downside to Instant Messenger is that it can be a huge distraction from school work as your child can be sitting at the computer in front of you, apparently hard at work, but actually chatting to friends instead. Most Instant Messenger applications appear as small boxes in the corner of the screen while a conversation is going on and will disappear as soon as you click on the open document behind it. There are many social networking sites springing up on the internet. Essentially they connect people with similar interests and allow them to share content. This usually involves posting photos, videos, and messages. The messages are not private and can be seen by other people in a group of ‘friends’ or ‘network’. Aside from causing a distraction from school work the main issue with sites such as these is that while some of the content might seem to be harmless fun to the people posting it, it is creating a culture of cyber bullying whereby children are bullied online. Not just limited to social networking sites, cyber bullying can also be by email, text or other self publishing websites. With MP3 players rapidly changing the face of the music industry CDs will probably soon become a thing of the past. The huge growth in the music download industry has led to a spike in music piracy which has left record companies, and musicians reeling. The legal grey areas around downloading unauthorised music and peer to peer download sites are fast being cleared up with stricter controls and greater powers for the music industry to trace the culprits. If your child has a large digital music library speak to them about where they get their music from, it’s likely that they don’t realise that many sites are illegal, or that there could be financial implications.